Pardon my ignorance here but did there used to be a second siding at Woodford? I know there was a spur track or two but never knew there was a second full-on siding with controlled switches and all. Thanks jb, that makes sense. If anyone has any knowledge that contemporary practice was/is different, please weigh in. It's straightforward to change the logic. Approaching Sandcut from the north (left in the diagram): Each signal will only light if it's approach track is occupied. Approaching from the south (right, coming from Bena/Caliente) if either approach track is down both signals will light. Caliente will light both of the double-main approach tracks if either one is occupied. On the single approach it will light only if the single approach track is occupied. Guessing in the diagram that Caliente stands in for Bena so the description I gave matches Caliente (not Bena). All of this is for the searchlights prior to the upgrades in the past few years. Hope this helps. Yes, the spur track used to be the 'short siding', with turnouts at both ends. The north end was just about underneath the hwy 58 overpass, a little north. I know this entirely from collected photos and notes found online. I have seen pictures of a two headed mast at the north end, removed in the 80s along with the bulk of the rail leaving just the spur that's there now. 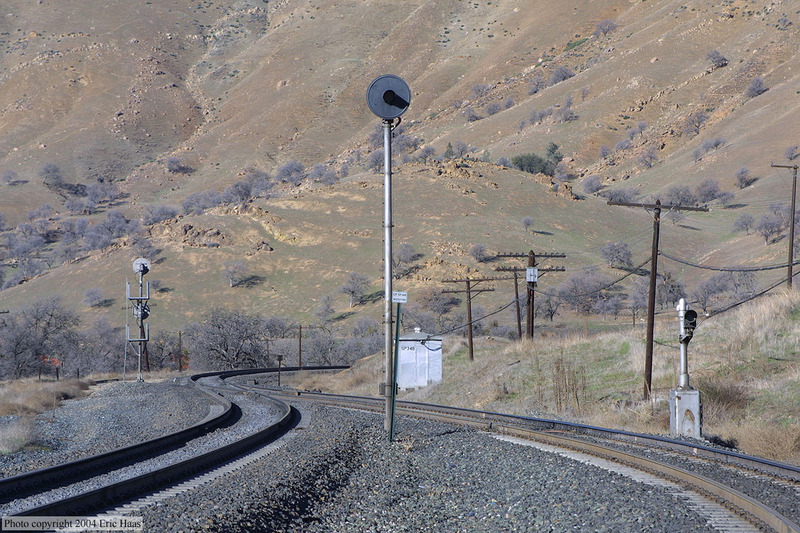 The south end of the spur remained fully signalled until the mid 90s. I can post links later if you like. So the behavior you describe is not entirely consistent. Does this have something to do with north of Sandcut being double-track vs south of it being CTC? I may have said this previously in this thread but if not one of the many idiosyncrasies I have found about SP signaling practices is that they were consistently inconsistent with how they did things. It could have to do with the CTC vs. Double-track. I am kinda speculating/theorizing here but with the current of traffic double-track the signals were spaced differently and as one direction only would normally see them lit I am guessing they did that to save money on bulbs? but thanks for the response @kc9jts. And you are correct that I have excluded Bena on my layout due to space constraints.